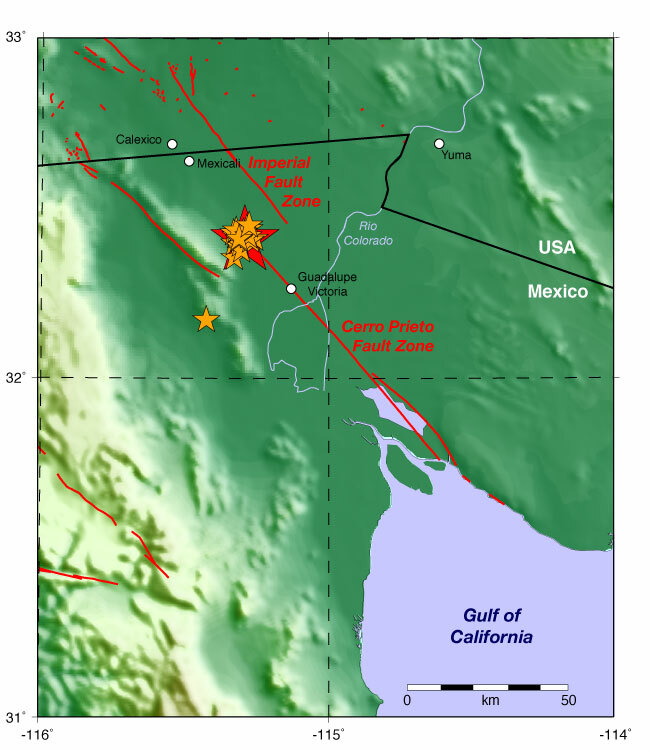 On Friday February 8 2008 at 11:12 PM (PST) we recorded an earthquake (preliminary Mw 5.4) located near Guadalupe Victoria. Initial source parameters for this tremor are indicated below. The epicentral distance (i.e. the distance separating the epicenter and the closest station in the recording network) for Anza is 115 km (1.04 degrees). This map shows the mainshock as a red star. Associated aftershocks are orange stars. Anza network stations are yellow triangles. Gray lines are major rivers. Towns in the region labeled. Staff at the SIO Visualization Center have made a 3-D visual object of this event. Viewing the object requires downloading and installing a third-party freeware plugin. 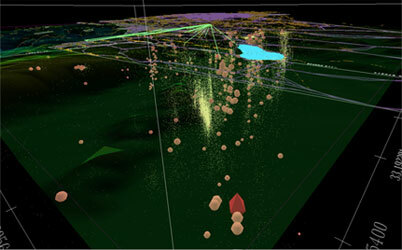 This interactive 3-D visualization includes the location of the mainshock hypocenter (red diamond), historic earthquakes over magnitude 4 (salmon orbs), historical seismicity (~7000 yellow points), town names (orange text), primary roads (purple lines), known fault traces (brown lines), an outline of the state of California (gray lines), and seismic station telemetry paths (green lines). We include topography and bathymetry of the region where regions of high elevation are in browns and light greens and regions of lower elevations are in forest greens, on the sea floor light blue indicates higher elevations than the darker blues. We operate a broadband station on Mt. Soledad. At 23:12 (PST) station SOL recorded the P wave from this event. Here is a view of that event as picked by our analyst. A red P indicates a P wave arrival, a red S indicates an S wave arrival. San Jose Mercury News: "5.4-magnitude quake rattles Baja California"
The Associated Press: Moderate Quake Rattles Baja California""